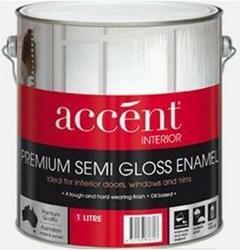 Accent Interior Semi Gloss oil based Enamel is ideal for interior doors, windows and trims. It has a tough hard wearing finish. Can be applied to interior doors, windows, architraves, skirting boards, cupboards and furniture.